In the past few years the rhetorical back and forth between China and the United States over economic institutional governance has intensified. Along with concerns over the governance of multilateral development banks and the role of China’s currency in the International Monetary Fund, free trade agreements (FTA) have become part of a war of words over the future of the economic order in East Asia. Despite the United States repeatedly claiming to welcome China’s rise in a general sense, at other times it questions the Asian giant’s commitment to “international norms and rules.” This has led analysts to question whether the United States is attempting to contain and isolate China through the Trans-Pacific Partnership (TPP) a trade agreement that includes Japan and 11 other Pacific Rim nations. Beyond a formal military alliance, few international arrangements signal deeper political cooperation than an FTA. While economic policy is the primary concern of any trade deal, political concerns also play an important role. Along with economic gains, FTAs are a form of alliance that binds states as well as economies closer together. By creating a formal treaty that institutionalizes economic policy coordination, states are aiming to have greater firm-to-firm interaction that will more closely link the interests of individuals, firms, and the states themselves. The TPP is no different. The agreement is clearly designed to bring states that are already close security allies, like the United States, Japan, and Australia, even closer while also attempting to bolster relations with others partners like Vietnam and Malaysia. This is not to say that the TPP does not stand on its economic merits alone. Liberal economists are generally in agreement that FTAs boost productivity and create economic gains for member countries by eliminating barriers to trade. The TPP, in particular, is said to “level the playing field” by creating economic policy convergence on labor, environmental, intellectual property, and state-owned enterprise regulations. While there are plenty of others who argue that FTAs are tools for multinationals to degrade the environment and exploit the cheapest labor pools, analysis of the TPP has generally shown that it should improve regulations in the Pacific Rim. In fact, many believe that China’s inability or unwillingness to meet the stringent rules, rather than geopolitical rivalry, kept it out of the agreement. Officially, any regional nation is welcome to join the TPP. 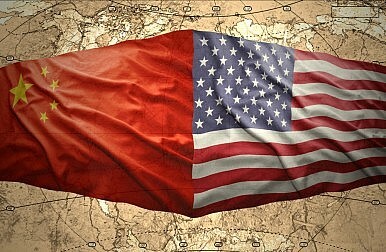 However, this has not stopped the intrigue and interest in the potential for a renewed Cold-War style rivalry between China and the United States. While there are no official security aspects of the agreement, the indirect knock-on effects are no secret to the policymakers involved. It is no coincidence that the United States recently lifted the arms embargo on Vietnam, less than a year after the TPP was signed. U.S. Defense Secretary Ashton Carter last year said that “passing TPP is as important to me as another aircraft carrier.” Those are strong words. President Barack Obama has also made it clear that the TPP is not aimed so much at containing China as at countering China’s growing influence in the region. When he said, “[W]e can’t let countries like China write the rules of the global economy,” his stance was clear. China, meanwhile, has been busy creating or deepening economic alliances with ASEAN, South Korea, and Australia, and spearheading a large multilateral FTA, the Regional Comprehensive Economic Partnership (RCPE), that would include India and other East and Southeast Asian nations. On the surface, it might appear as though China and the United States are attempting to carve out spheres of influence as was done during the Cold-War era, in which regions were divided into capitalist and communist blocs. The parallels are there, though not complete. Politically, China may be a closed authoritarian system, but economically it has a far more open and market-based system than the Soviet Union ever did. While the two major powers have, to date, avoided involving one another in their larger economic policy schemes, the possibility of future coordination cannot be ruled out. More to the point, the amount of overlap in partner nations means that, while the two major powers may be competing for influence, their targets are having their cake and eating it too. Singapore, South Korea, and Australia already have FTAs with both nations. If all these proposed trade deals actually become finalized, then RCEP and TPP would be like near-mirror images of one another — with only the largest countries left out of the competing agreements. The idea that China or the United States could act as mercantile hegemons that hold exclusive economic rights in vassal nations is not only anachronistic but wrong. Under the World Trade Organization’s system, FTAs can allow member states to give preferential treatment to one another, but this is a far cry from bloc economies that were closed off from one another in the Cold War. China and the United States also have strong bilateral economic ties and are currently working on a Bilateral Investment Treaty, a type of agreement often followed by an FTA. East Asia does not appear to be on the verge of economic division based on political alliance, but the two major powers are still keeping tally. While the United States and China may view FTAs as a tug-of-war battle for influence in East Asia, the smaller trade nations agree that they will not be picking sides outright. It may seem like this situation inflames the major powers’ rivalry, but instead, greater overlap could create an economic environment where the rules of a myriad of agreements slowly converge. At the same time, it can only be hoped that the visions for the future that China and the United States present to the region and the world also converge. The two are still miles apart on the appropriate economic policies for their nations and the region, not to mention other issues such as human rights, democracy, the role of NGOs, and territorial disputes in the South China Sea. For now, FTAs should not be seen in the same context as Cold War style economic blocs, but we should also understand that they hold more than just economic weight. Nations that are in the middle are actively engaging with the powers to demonstrate their ability to get along economically and politically with both. In the modern era, economic capacity and ties are more closely linked to security concerns than ever, but if the region as a whole can show that ties with both powers are possible then perhaps the two will be able to find common ground. Gordon Gatlin is a Masters candidate at the Yonsei University Graduate School of International Studies. His research focuses on commercial institutions’ effects on cooperation in security concerns.